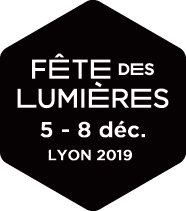 Fête des Lumières | Et Si ? What if the docks of the Saône became an art exhibition? Like a succession of probabilities, huge coloured drawings inspired notably by the works of Joan Miro, Picasso or Mondrian, pass across the majestic scene comprising the Fourvière basilica, the chevet of the Cathédrale Saint-Jean and the façade of the Palais de Justice. Different illuminations for each of these buildings sets the tone for each sequence. Strollers can admire this moving fresco as they stroll from the quai des Célestins to Pont Bonaparte bridge.